Discussing "The Future of American Health Care" are (l to r) moderator Daniel Polsky, Executive Director of the Leonard Davis Institute of Health Economics (LDI) and panelists Ezekiel Emanuel, Chair of the Department of Medical Ethics and Health Policy; Stephanie Carlton, Senior Health Care Expert at McKinsey & Company; former U.S. Congresswoman and current CEO of the Better Medicare Alliance Allyson Schwartz; and Paul Howard, Director of Health Policy at the Manhattan Institute. 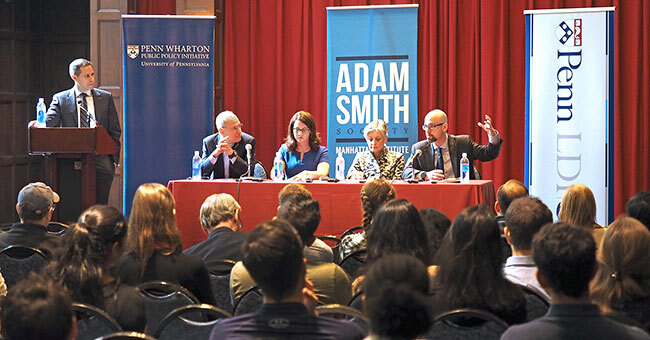 The event was co-sponsored by the Penn-Wharton Public Policy Initiative (PPI), the Wharton Adam Smith Society, and the Leonard Davis Institute. Click image for larger. 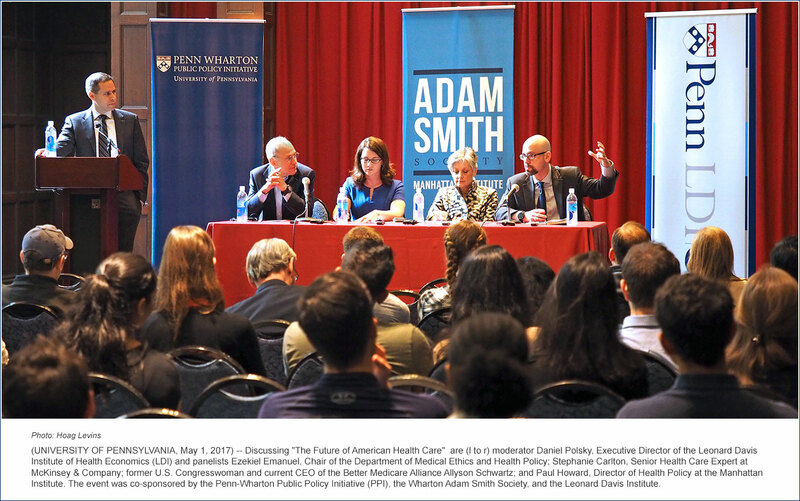 [Length: 3:26 ] The past and future Capitol Hill quest for a bipartisan approach to health care reform. [Length: 2:38 ] The AHCA vs ACA approaches to state waivers. [Length: 2:28 ] The AHCA's "Continuous coverage" vs. the ACA's mandate. [Length: 1:37 ] U.S. health care lags far behind other industries in productivity. [Length: 2:37 ] Medicare Advantage as a model of cost containment?